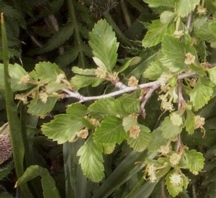 The California chaparral has hot summers with temperatures commonly above 100 ° F . The winters are about 50 ° to 60 ° F, but can very quickly drop to freezing. Occasionally there is snow in the winter, but it quickly melts off. Most of the rain that falls on the chaparral comes from storms over the Pacific Ocean. Fires are common in the chaparral. checkered. The twigs of this tree are rigged and the lateral twigs often spur-like, bright red -brown, and at first hairy, finally ashen or reddish gray and smooth. It's crown grows very wide, and it is a skinny wiry tree. changes of climate, and the poor soil. This tree seems to be invincible because it cannot be killed by an axe (it cannot be killed by taking chops at it), drought or fire, so it has been given the name "hardtack". Fires usually kill the top of the tree but the trees don't burn as quickly as other shrubs in the chaparral. They sprouts new growth from their root crown and grow quickly after a fire. 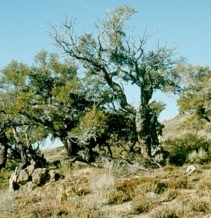 The mountain mahogany loses its leaves during the hot, dry season to conserve water. The Navahos use the twigs with their white flowers as prayer sticks. The handles of Navaho distaffs are made of this wood probably because it does not splinter easily. It is hard so the Navahos make dice from it. The Mountain Mahogany is not endangered. In fact it covers large areas. It can be found in Oregon, Baja California, the Channel Islands, South Dakota, Utah, Texas, Oklahoma, Arizona, and Mexico. Van William, Dersal R. Native Woody Plants of the U.S. Their Erosion control Wild Life Value U.S. Dept. Agriculture (1937). Washington D.C.
Sparge, Charles . (1949). Manual of the Trees of North America vol.2. New York Dover Publications.Inc. Ricciut, Edward R. (1996) Chaparral . New York Benchmarks Books.